The fight over the Keystone XL pipeline has illustrated the need for a comprehensive U.S. energy policy. Joseph Edgar and Brian Marrs explain how we can break away from oil. 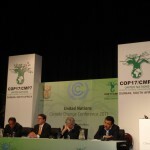 Speaking but not listening – early failures of South Africa’s Indaba approach?